With a stay at TRYP by Wyndham Halle, you'll be centrally located in Halle (Saale), within a 10-minute drive of Beatles Museum and Franckesche Foundation. This hotel is 2.5 mi (4.1 km) from Marktkirche and 2.6 mi (4.1 km) from Handel Monument. 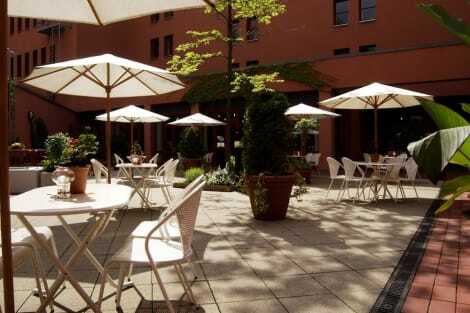 Located in Halle (Saale), Hotel Atlas Halle is a 2-minute drive from Halloren Chocolate Factory and 8 minutes from Franckesche Foundation. This hotel is 1.9 mi (3.1 km) from Beatles Museum and 2 mi (3.2 km) from Marktkirche. Make yourself at home in one of the 89 individually furnished guestrooms, featuring free minibar items and flat-screen televisions. Complimentary wireless Internet access keeps you connected, and satellite programming is available for your entertainment. Private bathrooms with shower/tub combinations feature complimentary toiletries and hair dryers. Conveniences include phones, as well as safes and desks. Take time to pamper yourself with a visit to the full-service spa. If you're looking for recreational opportunities, you'll find a spa tub, a sauna, and a fitness center. This hotel also features complimentary wireless Internet access, concierge services, and babysitting/childcare (surcharge). Getting to nearby attractions is a breeze with the area shuttle (surcharge). lastminute.com has a fantastic range of hotels in Halle An Der Saale, with everything from cheap hotels to luxurious five star accommodation available. We like to live up to our last minute name so remember you can book any one of our excellent Halle An Der Saale hotels up until midnight and stay the same night.